Stamping - Leading Technologies - A Division of Composidie Inc. Through parent company Composidie Inc., we offer full-service reel-to-reel and loose-peice stamping capabilities sure to be the right fit for any job. Composidie's 80 presses in three facilities make the stamping possibilities virtually endless. Our presses run up to 1,800 strokes per minute. 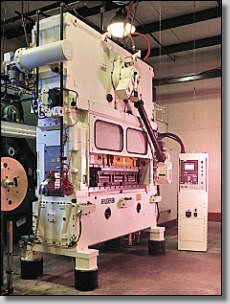 We have 80 high-speed stamping presses to meet every need.